This beacon's name also appears in the forms 'Min-rimmon' and 'Minrimmon'. Min-Rimmon was not a solitary peak, but stood among a cluster of forested ridges and crags that stood out from the flanks of the White Mountains. These crags were collectively known as Rimmon, and the forests that covered them were Taur-Rimmon, the 'forest of Rimmon'. Min-Rimmon gained its name as the most prominent mountain among the crags (Min- in this context means 'mountain peak', so Min-Rimmon was the 'peak of Rimmon'). The name Rimmon itself was an ancient one, dating back to before the founding of Gondor, and its meaning had been lost to memory. This perhaps explains the fact that the spelling of the name is not completely regularised: Min-Rimmon is the most common variant, but the name is also sometimes spelt Min-rimmon or Minrimmon. There is some slight evidence of a settlement or fortification at Min-Rimmon. At least, after the War of the Ring news of the victory was specifically sent there, implying that there was more than a simple beacon on the mountain. If such a settlement existed, however, it is never described directly, nor shown on any map. The only direct reference to Min-Rimmon in the histories of the War of the Ring is during the ride of the Rohirrim to the aid of Minas Tirith. Finding the main road defended by enemies, they discovered the existence of the Stonewain Valley, a secret way dating from ancient times that ran '...through Drúadan to Rimmon...' and then '...behind Rimmon and down to Dîn...' (The Return of the King V 5, The Ride of the Rohirrim). These references, however, are rather puzzling: Min-Rimmon was some seventy miles westward of the Drúadan Forest, and it would make little apparent sense for the road to run past Rimmon to reach Minas Tirith in the east. This discrepancy seems to have arisen during the drafting process of the story. In the original description of these events, Tolkien has Théoden and his people meet the Drúedain, and thus learn of the Stonewain Valley, in Taur-rimmon Forest, the forests around the feet of Min-Rimmon. In later revisions, Théoden still camps under Min-Rimmon on his journey (on 12 March according to the Tale of Years) but does not encounter the Drúedain until the following day (in a different forest - the Drúadan Forest - on 13 March). The use of 'Rimmon' was certainly deliberate at the time of writing, and matches the events as originally laid down, but alongside the textual change that moved the Drúedain a day's journey to the east, the reference to 'Rimmon' should probably have been changed to 'Eilenach'. This is far from certain, however, and it is conceivable Tolkien may have been considering extending the course of the Stonewain Valley as far westward as Min-Rimmon. Though the simplest explanation is probably that 'Eilenach' should replace 'Rimmon' in this account, there is sufficient doubt over Tolkien's intention that later editions of The Lord of the Rings nonetheless leave this potentially problematic text unchanged. There is only one piece of definite evidence that bears on the foundation of Min-Rimmon's beacon, in Unfinished Tales of Númenor and Middle-earth. There (I 2 (iii) Cirion and Eorl, to be precise) we are told that the three oldest beacons (Amon Dîn, Eilenach and Min-Rimmon) were built to communicate with the northern defenders of Gondor before the foundation of Rohan in III 2510. The suggestion there is that the first beacons were constructed because of the loss of the palantíri, which took place between III 1437 (when the Stone of Osgiliath was lost during the Kin-strife) and III 2002 (with the loss of Minas Ithil to the Nazgûl, and with it the Ithil-stone). After this time Orthanc was kept locked by the Stewards, and its palantír, now inaccessible, also fell out of use during this period. Min-Rimmon's beacon, then, was likely put in place during the latter half of the second millennium of the Third Age. The meaning of Rimmon is uncertain, and indeed in Appendix F to The Lord of the Rings, Tolkien specifically says that its ancient meaning had been forgotten. In his unfinished index to The Lord of the Rings Tolkien described it as a 'group of crags', but whether this was meant as an interpretation of the name, or merely a description, is not clear from the context.  The element rim- can be read as a 'great number', so 'group of crags' is not implausible as an explanation of the name. We're explicitly told that Amon Dín, Eilenach and Min-Rimmon were the first three Beacons to be established, as a means of communicating with the people of Anórien. It would seem natural to presume, therefore, that they would be the three nearest Beacons to Minas Tirith, and thus the easternmost members of the full system, but in fact this was not the case. 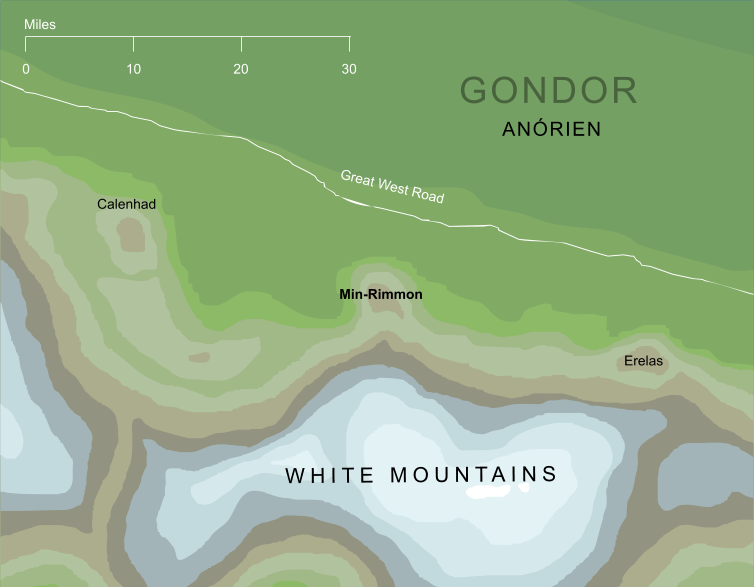 Amon Dín and Eilenach were indeed close to Minas Tirith, but from the Eilenach beacon to Min-Rimmon there was a wide empty space of some seventy miles, which would only later be filled by two further beacons, Nardol and Erelas. This seems to be a discrepancy: not only is it rather implausible that the Eilenach beacon could be seen from Min-Rimmon dozens of miles away, but if it could, then there was no apparent need to interpose two later beacons. Perhaps we can take it that the beacon on Eilenach was visible from Min-Rimmon, but only barely, so when the system was extended, two further beacons were added to improve the overall system. Actually, there is probably a more prosaic solution to this problem. During the writing of The Lord of the Rings, Tolkien developed different schemes for the placement of the beacon-hills, and in one of these schemes Amon Dín, Eilenach and Min-Rimmon were indeed the easternmost of the beacons. The idea of Min-Rimmon as one of the original beacons comes from a note on the Halifirien reproduced in Unfinished Tales, and it seems at least possible that, while writing this note, Tolkien was thinking of one of these earlier configurations rather than the order of beacons in the published Lord of the Rings. It is therefore perfectly possible that he meant to write 'Nardol' (the third beacon counting westwards in The Lord of the Rings). Lacking any definitive evidence that this is an unintentional error, however, we follow the comments in Unfinished Tales as canonical here, though they should be considered with due caution. Original content © copyright Mark Fisher 1997-2001, 2018. All rights reserved. For conditions of reuse, see the Site FAQ.